Seneca Falls, NY; June 1, 2018. USDA personnel with the Agricultural Research Service Plant Genetic Resources Unit, Geneva, NY, will be demonstrating apple and grape grafting techniques at the August 7-9, 2018 Empire Farm Days at Rodman Lott and Son Farms, 2973 State Route 414, in Seneca Falls, NY. The demonstrations will take place daily at 11:00 am in the Cornell University building. 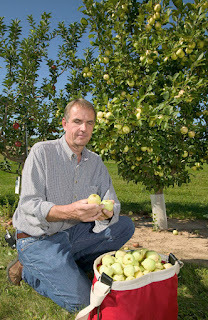 Grafting, the joining of two or more plants together to grow as a single plant, can improve apple and grape production. In their daily presentations at Empire Farm Days, the USDA staff will be talking about how the selection of rootstocks affects fruit quality and changes the shape and productivity of the upper section of the graft known as the scion, and how scion traits can be modified by using different rootstocks. “Grafting is the most efficient method to propagate apple varieties and manage tree size,” said USDA ARS Apple, Grape, and Tart Cherry Repository Farm Manager Bill Srmack. The USDA ARS Plant Genetic Resources Unit, located in Geneva, NY, acquires maintains, characterizes, and distributes plant genetic resources of selected fruit and vegetable crops to develop new hardy varieties that can stand up to pests, diseases and environmental stresses. The 300-acre Empire Farm Days is the largest outdoor agricultural trade show in the Northeastern U.S. with more than 600 agricultural institutions, organizations and industry representatives with exhibits, information, demonstrations, educational seminars, live animals, and farm safety and rural life displays. Learn more at www.empirefarmdays.com or call 877-697-7837. 0 Comments to "Apple & Grape Growers! USDA Will Offer Grafting Demos at 2018 Empire Farm Days"